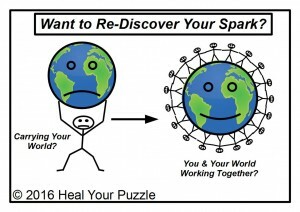 Heal Your Puzzle » Blog Archive » Lost Your Spark? Does part of your Life feel like it has lost its Spark? Feels flat? Is just routine? No enthusiasm? Maybe you seem always to be doing things for others and never for yourself? Maybe your life may not even feel like yours anymore? This year seems to have a Theme running… January started with looking at ‘Clearing Your Space‘ and then in February I wrote about ‘Does your Life have a Pulse?‘ and then in March ‘Sensory Perception‘… all about finding what really makes you tick… what makes you come Alive! What Happens when your Spark is Hidden? Life becomes flat and routine but not only that you may begin to feel lost and opportunities for something new in your life stop happening. Your World may start to feel limited or restricted; you may lose interest in things that used to make you happy; you may feel bored. Your Spark can also become hidden as a form of self-protection when you feel it is not safe to be present in certain circumstances. An outer Persona may be created to help you deal with an aspect of your life and then this may become the Norm.